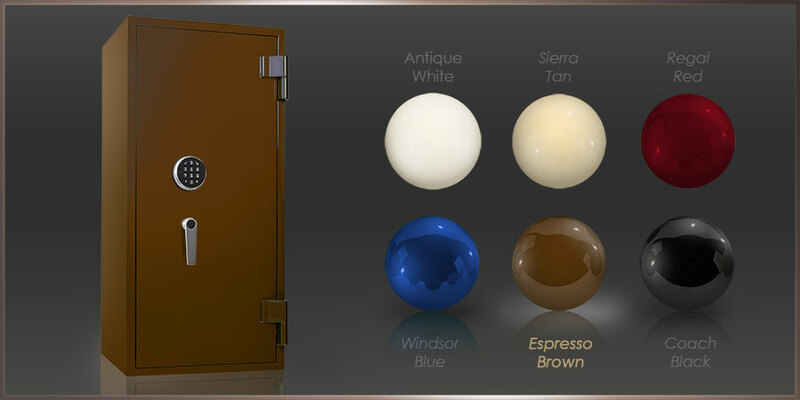 Estate Series High Capacity Luxury Safes - Highly Configurable High Security Safes - Brown Safe Mfg. In response to increasing requests for a more sizeable security solution, the Estate Series is our heavyweight lineup of luxury safe offerings. Affording a wide range of size and protection levels and built from the ground up for flexibility, these monolithic luxury icons are bristling with features along with a wide selection of interior configurations. Giving you a sizable luxurious space to safely contain your family's most important assets. Hand-crafted using only the highest grade materials and custom created for your needs. The Estate Series of luxury home safes offer multiple intelligently designed interior features to store and protect all that your family holds dear so that it can be passed down for generations. From solid steel construction and advanced security measures, to high-gloss exterior finishes, hardwood jewelry drawers available in your choice of finish and sizes to fit your needs, door activated LED interior lighting, fingerprint reading entry, and much more. Layouts customized to fit your collections and family heirlooms. Multiple interior configurations provide the perfect solution to conveniently store your Family heirlooms, sensitive documents, watches, jewelry, and many other valuables that are invaluable to you and your family. A wide variety of hardwood types and finishes are available to create the perfect safe to match your personal tastes or home's decor. Select from 18 interior drawer layouts thoughtfully designed for convenient storage of specific jewelry pieces, currency, passports and more; keeping all your items safe and secure. Additionally we offer several customizable interior options to fit just about every valuable one would want to keep safe and secure. 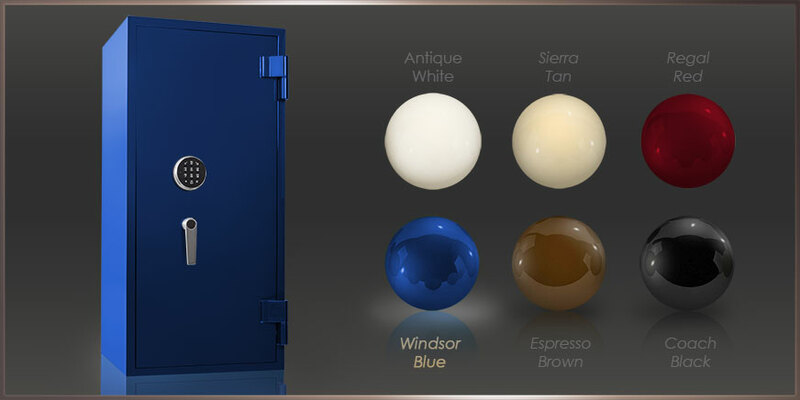 The Estate Series of luxury safes offer the most advanced materials and methods of construction to bring the superior protection only a Brown Safe can deliver. Available in 4 protection levels, and with or without fire protection in each, an Estate Series safe provides the perfect security for your demands. The same premium protection relied on by the US government in Military Bases and Embassies around the globe. At Brown Safe, protection has been, is, and always will be our number one priority. 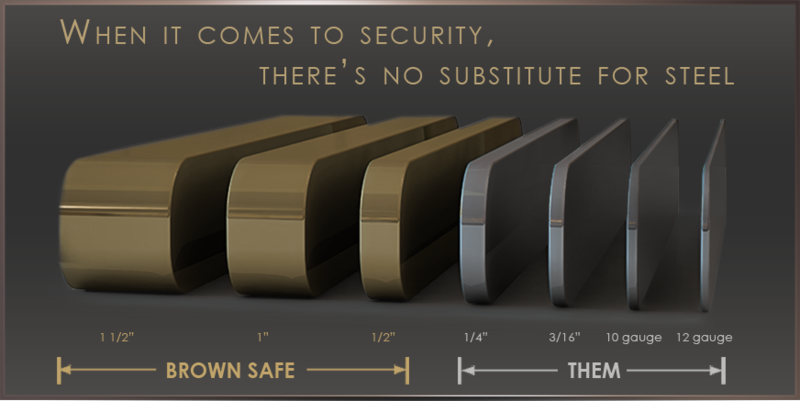 Our dedication to this core value has earned Brown Safe an industry-wide reputation for the highest quality and most secure safes. Our starting Estate Series safe models come with a half-inch-thick solid steel door and a quarter-inch-thick solid steel body. The top-rated safes by the majority of safe builders don't offer this much protection. If you haven't yet browsed the"Protection Levels" pages within our "Safe Buying Guide" section, we highly suggest you do. Here you'll find a complete overview of the standard protection ratings commonly used within the safe industry and important information covering U.L. ratings, as well as a complete breakdown of the security features of our protection levels. …Click here to learn more. While many builders claim the minimal protection their safes offer, coupled with the safes daunting appearance are sufficient enough barriers to ward off most criminals, we strongly disagree. In truth, the majority of safe manufactures have been cutting corners for years now in an effort to battle the waves of imposter "safes" imported from overseas. Until recently, the daunting looks of an impressive safe were enough to cause criminals to assume it to be a high quality safe and to look elsewhere for an easier opportunity. But this is no longer the case, with the internet and the popularity of public video sites like YouTube, this hidden truth about today's safes is now common knowledge within the criminal element. A few simple keystrokes is all it takes to view accurate videos of top brand safes being defeated within minutes by simple hammers and crowbars. The low quality safe building techniques frugal safe builders have resorted to for years are finally being revealed to the masses, which in turn is spawning a renewed wave of burglary efforts by criminals everywhere. As the known weakness of these safes spreads, millions of safe owners fall under ever increasing risk. Need proof? Try typing "safe cracking" or "security on sale" into YouTube and see what comes up. The growth of the internet and streaming video coupled with recent advances in modern tool production methods also means common criminals are now gaining access to safe cracking tools once reserved for the safe cracking elite, along with the knowledge to use them. In trying times like these, do you really want to entrust the storage of your most valuable treasures to a "safe" that can literally be pried open within minutes by nothing more than a hammer and crowbar? To learn more about a safes protection levels, Click here. Your senses will be awakened from the moment you open the doors to your Estate Safe. Whether you enjoy the fine feel of our fabrics and Ultrasuede® safe linings, or the scents of our fine selection of 8 standard hardwood drawers. Our hand-built interiors are designed to look and impress the most discerning of senses. The interior walls, shelving, and drawer linings of all luxury Estate safes come standard with your choice of lush black velvet, ivory velvet, black ultrasuede®, or sand ultrasuede®. The jewelry drawers and interior trim in our luxury safes are custom built from your choice of our hand selected stock of hardwoods. hardwood drawers and trim while establishing a vibrant luster for the cherished valuables within. All Estate Series Safes can be fitted with Orbita watchwinders so that your automatic wrist watches can be kept secure and ready to wear at a moment's notice. Estate Luxury Home Safes are available with your choice of two different types of Orbita Watchwinders. Either Rotorwind or Programmable winders can be specified to fit the needs of your timepiece collection. This winder is designed to swing the watch, instead of rotating it, to mimic the natural action of the wrist. At either 8 or 12 minute intervals, Rotorwind modules make one single revolution which triggers a series of oscillations that gently swing the watch back and forth. We know not all your watches have the same winding needs. With Orbita Programmable watch winders integrated into your jewelry safe, a sophisticated microprocessor controls the watch winder cycles; and your choice of clockwise, counter-clockwise rotation, or automatic reversing when desired. 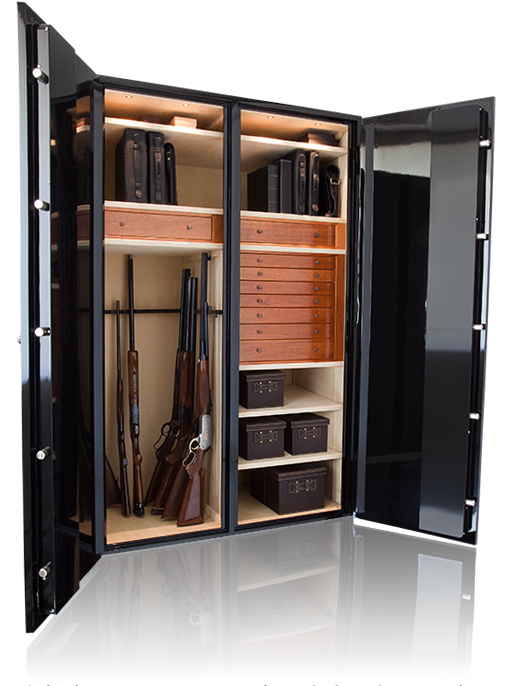 In the Estate Series safes, we've designed an assortment of interior configurations and rifle racks to support the varied needs of gun collections. 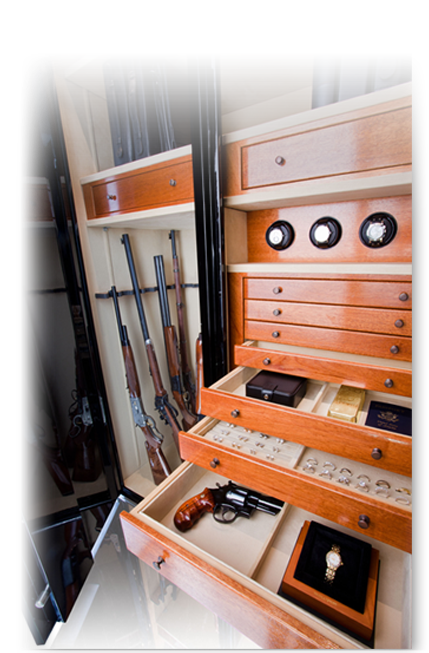 All gun racks are built using the same fine hardwood selected for the interior drawers and wrapped with a durable interior lining to prevent any scratching of fine firearms. Depending on the size of your safe and configuration, our racks will hold anywhere from 5 to 44 rifles comfortably. 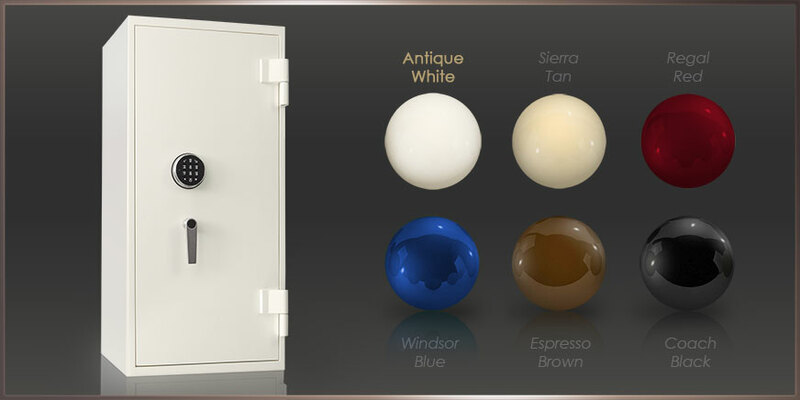 The Estate line of safes deliver a vast array of standard paint finishes, wood types, Ultrasuede colors, and hardware options. 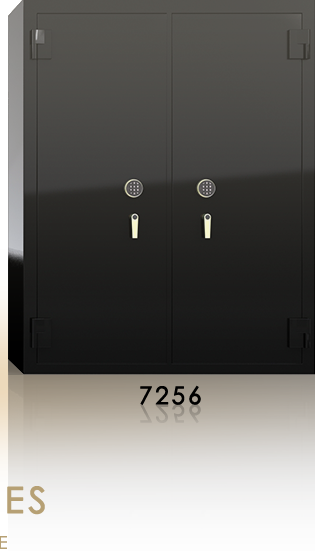 Estate Series Safes offer three metal finish choices for your safe's exterior lock and handle. Choose either a warm brass finish, a cool muted finish of brushed stainless,or upgrade to a deep lustrous handmade finish of oil rubbed bronze. The interior walls, shelving, and drawer linings of every Estate Series safe feature your choice of lush velvet fabrics in black or ivory, or you can choose to upgrade to the luxuriously soft Ultrasuede® interior in either black, sand, or a host of custom color options. The jewelry drawers, necklace rack, and interior trim in all Estate Series Safes are custom-built using our hand-selected stock of hardwoods. Choose from eight of our premium hardwood types to adorn the interior of your luxury safe, or if you have a different look in mind we can accommodate custom wood finishes and procure additional material types. Convenience is a key component to a luxury safe, and the Estate Series has been designed to incorporate all of the necessary features one would want to securely organize their valuables while maintaining ease of use - including a simple secure means of gaining entrance. This luxury lock offers the ultimate in security and ease of use. Simply touch and open your safe, or select to unlock using a push button code. The fingerprint lock comes embedded in a highly ruggedized casing with matching handle. This biometric lock housing is custom machined from solid aerospace grade aluminum exclusively for Brown Safe. The industrial-grade casing provides increased outer lock protection while the ergonomic position of the biometric fingerprint reader allows for effortless access to your Estate luxury home safe. The ideal lock for the traditionalist Its beauty is only surpassed by its simplicity. Also, available in a key-locking-model which places a keyhole at the center of the dial and gives the user the option of locking out the dial. Once locked out, the dial will not function until the key is reinserted. Estate Series Safe that suits you.